A Reserve for a Botanic Garden is shown on an 1854 plan of the township of White Hills. 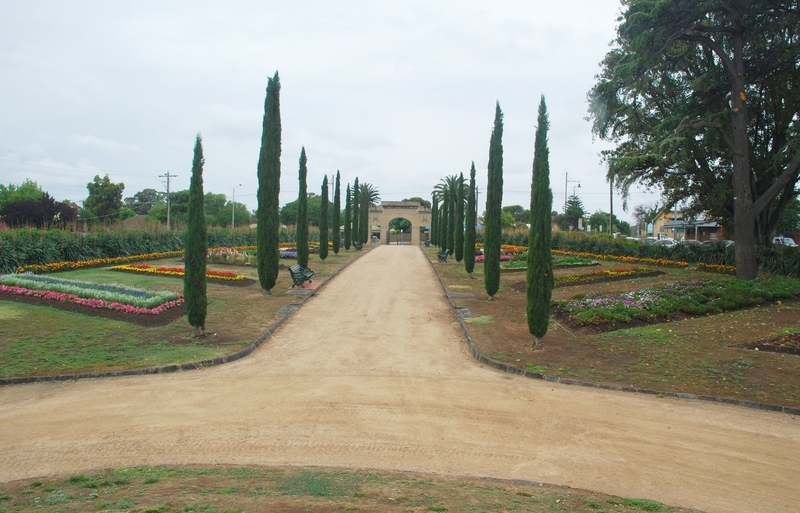 The garden was formed around the Bendigo Creek which was later straightened to form an ornamental lake. By 1869, 266 trees had been planted, including 180 Blue Gums. In May 1870 a total of 1857 plants were recorded and another 1117 plants were ready for planting. The planting included 600 Blue Gums, 292 Pinus halepensis and 40 P. radiata. Plants had been received from Ferdinand von Mueller of the Melbourne Botanic Gardens including 20 sultana cuttings in 1871. By 1872 the gardens included a hothouse, rotunda, 200 roses, and a zoo with monkeys, koalas and birds. In 1882 there was a good collection of trees and shrubs representing the flora of every country and it was a popular place for picnics. A pavilion was built in c1910 and in 1925 an Arch of Triumph was erected at the main entrance as a memorial to those who served in the First World War. Today there is a fine collection of trees and shrubs, flower beds, animal enclosures and aviaries. The White Hills Botanic Gardens are of historical, architectural, scientific (botanical), aesthetic and social significance to the State of Victoria. The gardens are of historical significance as one of Victoria's earliest regional botanic garden reserves. First shown on a plan of 1854, a date that coincides with legislation that allowed for municipal Councils to make bylaws for the establishment of botanic gardens. The reserve was gazetted in 1857, along with other botanic gardens at Ballarat, Malmsbury and Hamilton. Earlier Gardens had been established at Melbourne (1846), Geelong and Portland (1851) and Williamstown 1856. The Gardens are of historical significance as one of only two in Victoria (the other being the Hamilton Botanic Gardens) that still retain animal exhibits related to the acclimatization movement established in the nineteenth century. The 1925 Arch of Triumph is of historical and architectural significance as a rare example of this building type in Victoria. The only other arches, all First World War memorials and of different designs, occur at Ballarat (1920), Murtoa (1921) and Mansfield (c1923). The Arch of Triumph is a Mannerist design with massive rusticated voussoirs and decorated with wreaths. The Arch incorporates a list of servicemen on two metal plates. The gardens are of aesthetic significance, forming a picturesque landscape around a central lake planted with remnant River Red Gums and exotic trees. The mature conifer planting along the western boundary comprising of Pinus pinea, P. radiata, P. halepensis and individually significant P. torreyana and P. roxburghii, both rare in cultivation, is an important and prominent landscape planting. The landscape is further enhanced by an avenue of Ulmus x hollandica along the southern boundary, stands of Eucalyptus, including remnant E. camaldulensis, E. melliodora, and a cultivated E. globulus subsp. globulus. Near the main entrance are two large Ficus macrophylla and a Cedrus deodara. The gardens are of scientific (botanical) significance for a number of rare plants and fine specimens. The Acacia karroo is rare in Victoria, only two other plants are known, at Williamstown (Holy Trinity Vicarage) and the Royal Botanic Gardens, while the only other example of Dovyalis caffra is at Werribee Park and a small plant in the Royal Botanic Gardens. The White Hills tree is the finest and largest of the species in Victoria. The Callistemon brachyandrus is an exceptionally large specimen and the Livistona australis, Juniperus virginiana, and Schinus terebinthifolius are fine specimens and uncommon in cultivation. The gardens are of social significance for their on going use by the community for recreation and education. The Arch of Triumph is an important place of remembrance to those who served in the First World War. 4. 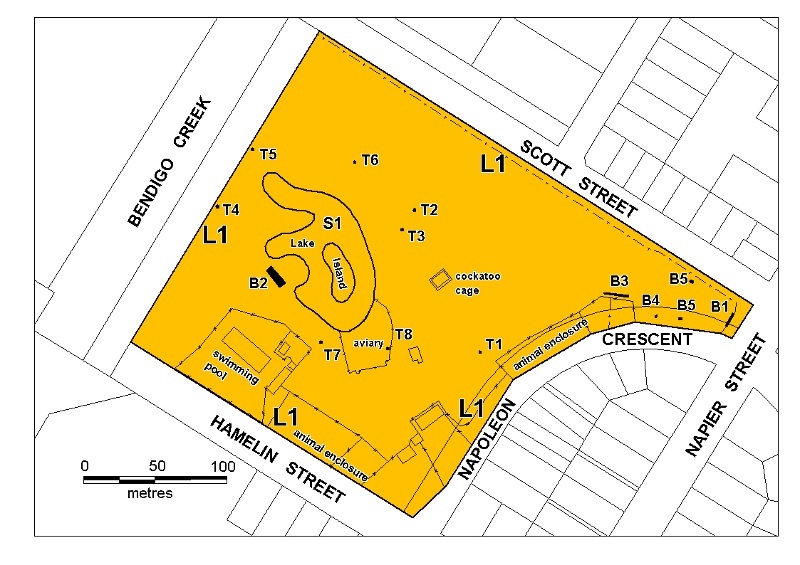 All of the land known as the White Hills Botanic Gardens and gazetted as Crown Reserve Rs 4855 [P126799] and permanently reserved for Public Gardens and part of the Napoleon Crescent road reserve marked L1 on Diagram 1915 held by the Executive Director. The Botanic Gardens reserve was first shown on a township plan of White Hills prepared by the surveyors general office in October 1854, only 3 years after the discovery of gold in the the district. The 35ac site was reserved for a Botanic Gardens in 1857. This follows shortly after other botanic reserves at Ballarat , requested in 1856 and reserved in 1857, Malmsbury 1857, Hamilton township plan 1850, reserved 1853, Geelong and Portland 1851, and Melbourne 1846. A plan of the site in the 1850s shows the Bendigo Creek flowing through the reserve. The creek was later straightened and the existing Lake is formed from the original creek alignment. This lake formation also occurred at Melbourne Botanic Gardens with the straightening of the Yarra River, while at Malmsbury a billabong of the Coliban River was transformed into the existing ornamental lake. In 1869, 266 trees had been planted of which 180 were Blue Gums. In May 1870 a list of 1587 were listed as being planted in the Gardens. This included 600 Blue Gums, 292 Aleppo Pines and 40 Monterey Pines. In 1871, Ferdinand von Mueller, Director of the Melbourne Botanic Gardens sent 20 sultana grape cuttings to the Bendigo Gardens and in 1872 he wrote to the Council in support of an applicant for the position of curator at the Botanic Gardens. In 1902 the gardens were reported to be "a poplar resort for picnics and such outings". Thereis a magnificent collection of all thatis beautiful of the world's flora, artisically arranged. The gardens will amply repay a visit to the sightseer, and also to the student of botany. The White Hills Botanic Gardens (1857) are of historical significance as one of the earliest in Victoria, only proceeded by the Melbourne (1846), Geelong (1851), Portland (1851) and Williamstown (1856) Botanic Gardens, and the same age as the Gardens at Ballarat, Malmsbury and Hamilton. The Gardens retain animal exhibits that were first established in the nineteenth century. Rare plantings in the Garden include Acacia karroo, one of only three mature trees in Victoria, others occuring at the Holy Trinity Church, Williamstown an Royal Botanic Gardens. The Dovaylis caffra is one of three trees, others occuring at the Royal Botanic Gardens and Werribee Park. The Pinus torreyana, Pinus roxburghii, Callistemon brachyandrus, Schinus terebinthifolius and Livistona australis are all of botanical importance. 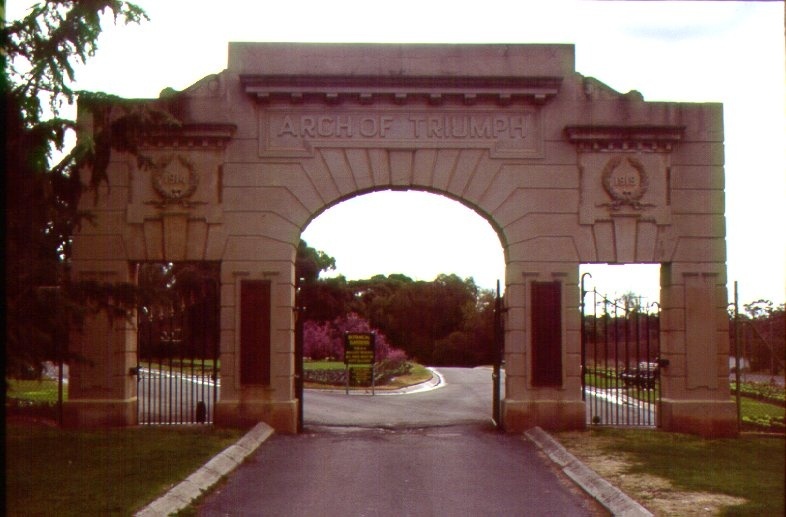 The Arch of Triumph (1925) is one of only four similar First World War memorial arches in Victoria. Others occur at Ballarat (1920), Murtoa (1921) and Mainsfield (c1923). All have a different architectural design and the White Hills arch is unique as the only example of a Mannerist design in Victoria. The Gardens are aesthetically important for a picturesque landscape the was developed around a lake that was formerly the Bendigo Creek. Indigneous plants were retained and a wide variety of new plants, both native and exotic, evergreen and deciduous, were introduced into the landscape. A planting of mixed conifers are planted along the western boundary and an avenue of Dutch elms along the southern boundary. The Arch of Triumph which is located at the main entrance and adjacent to a major highway is of high aesthetic value. The timber pavilion near the lak ealso forms an attractice landscape feature. The Gardens are important for their use by the community for recreation and education. The Arch of Triumph is an important place of remembrance to those who served in the first world war. Any other matter which the Council considers relevant to the determination of cultural heritage significance. * Painting of previously painted surfaces in the same colour. * Treatments to stabilise and protect timber, masonry and metal structures. * The planting of plant species to conserve the landscape character of conifers, elms and figs, indigenous riverine flora, and development of botanical collections and flora displays. * Repairs, conservation and maintenance to hard landscape elements, memorial plaques, asphalt and gravel paths and roadways, stone and concrete edging, fences and gates. * Installation, removal or replacement of garden watering and drainage systems beyond the canopy edge of listed trees. * All works and management requirements to comply with relevant legislation and animal safety requirements. * All works required to operate the pool complex and comply with safety requirements. * Removal of the pool complex.